I went onto AshraKoehnLove.com, but it appears that the website is no longer up. I typed it in both uppercase and lowercase letters, and I got the same thing: the site is no longer available. So, this is definitely a start. I went onto each one of the fake Instagram pages and left a comment on some of the pictures/videos. I couldn't comment on every profile because some of them didn't have any posts on them. I already reported the Facebook page, so now I'm gonna see if I can find out about the Google+ one. If I can't, then I'm going to assume that it has been taken care of. Ashra, you don't deserve any of this. You're a wonderful person who helps people in need; this impersonator has messed with the wrong spellcaster. Thanks for this.. it also cleared my mind and helped me avoid an Ashra Koehn Impersonator. I’ve noticed these Impersonators and her competitors are the cause for a lot of the bad reviews and these fake scammers make lies why? You can completely see that they are making up stories. Why would make a forum or give free castings or generously help others if your just wanting peoples money. It makes no sense. My theory is that they are the liars not Ashra. She’s been nothing but calm when I've freaked and seen these things and thought I was being scammed due to all of the fake gossip. She was calm and if you see this Ashra I am sorry I’ve freaked out. Sadly, someone who isn't aware that Ashra has Impersonators and evil competitors may fall for the fake gossip. There a lot of impersonators recently coming out. Ashra has put in a thread some of their Instagrams and hers. Because of Ashra's high success rate, there are a lot of people trying to make a quick buck and it is not good. It confuses people who need actual help and its not fair. There are already so many fraud casters out there. You can tell if they are fake if they use proper grammar for one. Ashra's emails are very formal and professional and she isn't rude at all. She doesn't demand money. She tells you outright that you can play when you are ready. Thank goodness that we know where we can find the real Ashra. IMPORTANT UPDATE: Someone is impersonating me and sending out friend requests. Note... I would never send out a friend request. It should be seen as a red flag if someone is claiming to be me and has contacted you via facebook. Here is a screenshot of what they said. This is from a competitor who is impersonating me. They never stop impersonating you Ashra. Have you reported it to FB yet? I can’t believe that people are still trying to impersonate you. I really wish they would stop. I’m sorry you still have to deal with these people Ashra. Hopefully people won’t get tricked by them and they will find your real Facebook page and other social media. There are people that need help from a real spell caster and they shouldn’t get tricked by someone that is impersonating you. I have to tell you there are a lot of people trying to impersonate ashra. She also has competitors who will try to harass us and try to make us go to them for our spells. I know I have had quite a few of them tried to send me emails. They even stalk my YouTube. Ever since my email is filled with nothing but spellcaster sending me messages and I don't even know who they are. 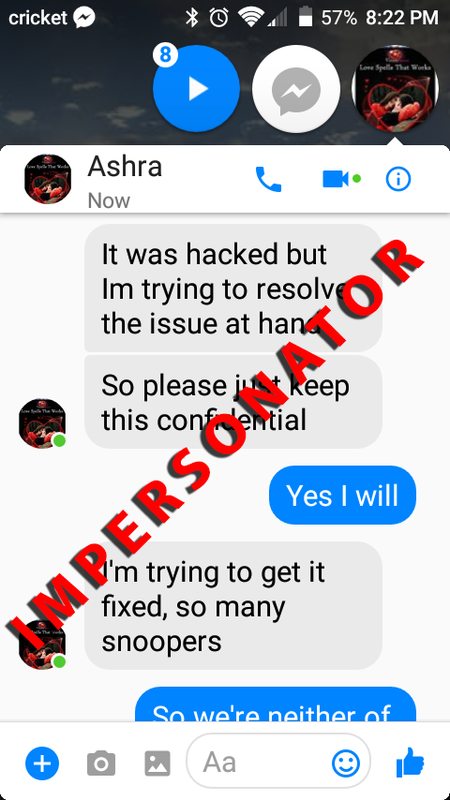 Ashra Impersonator - Scam Warning! My speciality is love spells!I customise all my spells for my clients! I am ASHRA KOEHN an Akychi Spell Master and witch my whole life. Let me soothe your heartache today and ease your mind. someone, your love spell will be extremely potent! all you will have to do is wait for your results to appear! Adrian S., joonbug19, Cheryl77 and 1 other person like this. Poor Ashra! I wish her lots of protection and help for these unfortunate people coming into her life, and ours by some type of extension. It is sad that people try to impersonate Ashra Koehn but it is even worse when they get away with it, but not for long. I hope Ashra will take legal action against all impersonators if still continuing after told to stop. I wish these people would realise what they are doing and stop it. I'm sorry this is happening to you ashra and I am very grateful to have found the real you. It really never ceases to amaze me the lengths some people are willing to go to in order to "make a living". they have got to be some of the most evil, lazy, immoral, vile people alive in this world to attempt to piggy-back off the successful career of the reputable @Ashra . it really makes me sick to think about the many trusting souls who have been preyed upon in their lowest, most desperate times. i just wish people would do a little research before handing their money over to a complete stranger. I'm sorry but I have to laugh when I see the length these scammers go to. I don't laugh because its funny, it's not funny at all, I laugh because I can clearly see that they have nothing better to do with their lives. You can tell by their grammar and spelling that it is not Ashra Koehn herself. Also, the information that they use is never correct and they never get their facts right. They also talk about things they know nothing about. You don't deserve this Ashra. What they're doing is wrong! I still can’t believe that people are still trying to impersonate Ashra. I wish they would stop. There are people who are trying to find a real spell caster to help them with whatever situation they have and they don’t need to get tricked by impersonators. I’m so sorry you still have to deal with these people Ashra. I hope that more people will find your websites and get your help before they get tricked by someone else. @Gabbie I agree with you completely. They’re ability to scam and spend on this time on pretending to be something they’re clearly not is utterly laughable. They can lie all they want but this forum will protect her true identity and we shall all get real, genuine help from her, the real genuine @Ashra herself. This woman is the queen of magic and no one can match her, no matter how much they try! I truly believe in karma for these sorts of things, the money given is going to cursed or better yet lost due to the inappropriate way of taking it. Ashra will be revenged and better yet, she will always always rise above it. Xo sarina. Wow, I didn't know this. I am glad I on the right site , and email to real Ashra one. I know some people can fake they ip address so we can't find they true identity. But how you so sure the fake one is in African, Indian, and Nigeria. Hi there, everyone where ever all of you guys are in the world! Hope everyone is doing just fine today! Hi @Nintendofan3! How are you doing today? I can't agree more with your comment! I can't believe that there are people who try to pretend to be Ashra! I believe that everyone is trying to find a real spell caster to help everyone with their problems with! I am also sorry @Ashra, you have to do deal with these kinds of people! Hope that people would be able to find you, Ashra before they are working with impersonators! Hello there everyone! How you people doing? Its really sad to hear that people are trying to impersonate Ashra. One should be totally aware for the scammers. Their main motive is to trap the clients and use their time and money for their sole benefit. Its so sad that people go to such level and do these type of things.Ashra must take a legal action against these people. Thank god that we are in the safe hands of Ashra and scammers should be punished for their deeds. Hey everyone!!!! I hope your all are doing good and having an amazing day. I really wish that these impersonators stop and that their page gets taken down and gets reported for trying to impersonate a professional spell caster. Ashra is an amazing woman and does not deserve this, it's good that we all have found the real Ashra and that we are all aware of the impersonators so that we could stay away from them and not get scammed. I wish that people don't find these impersonators and that those people who got fooled find the real Ashra and get help from her. It's really terrible that people have felt the need to impersonate Ashra. All because she has a huge success and they only want to hurt you more. It's hard for the people who really need the help because they can easily lose their hard earned money. It's also easy to tell who is the real Ashra vs a fake. She uses correct grammar and spelling and her emails are very formal. It's obvious that Ashra has a lot of impersonators because of her success through many years, because Ashra is the best spellcaster so why a lot of impersonators copying her, they are really no originality and that is so sad to find out. I believe the way to avoid a lot of impersonators of Ashra, we have to be careful and just go here on the forum and just ask for help if you really want to reach out Ashra. Ask for some people who already been on Ashra. You should just be careful and have a knowledge to know who is copying and who is the original. I do see alot of these other websites that have the name Ashra Koehn it them but alot of thr website are so poorly designed that a person who just heard of ashra recently would know that this isn't reslly ashras site. 1. Ashra doesn't have on her website that stupid roman handwriting. Ashra's is just regular and you're actually able to read it! @vy nguyen I still don't think we are sure about the nationality either but, in a lot of cases of fraud recently have been African/Indian. However, there are ways of finding the identity but, it's very tedious. So yes, this must be met with legal action. There is still not a ton of ways to prevent such incidents like this as this. The only thing we can do is to teach people ways to identify impersonators and such. Hey everyone!!!!! I hope your all are doing good and having an amazing day. I am so happy that I found the real Ashra and didn't get scammed by some other impersonators like how others did. I feel very sorry for those who got scammed out of money cause of these impersonators. Guys, trust me the real Ashra is just so amazing She's very kind-hearted and caring for all of her clients and truly cares for them and she never forces anyone for money, she will help to the best of her ability and she never gives up on anyone's situation and stays always beside us. I hope that more people find the real Ashra and that those impersonators get taken down. A new update:I think it really is quite a shame that Miss Ashra is so successful, and due to that, people are trying to pretend to be her. That is a legal matter right? She could bring the law into it if she wanted too, right? And the fact that there are so many people doing this too, sigh. They are even taking her spells and carving false websites after her! I actually can’t believe people think it’s ok to do this. Why can’t people have their own personalities and do their own thing rather than trying to be something they’re not. They could put bad names on people that are genuine and really try to do good of the world. It actually makes me sad that people are like this because the world with nothing but kindness would be amazing and like this forum every single one person here is nothing but kind and care. We all help each other and that’s how in general life should be. There are ways to avoid miss ashra impersonators. One way to avoid these types of people is based on the url. Well, of the email I mean. Most false spell casters and impersonators will use either yahoo email or gmail because it is a free service and they will not pay to make an account just to steal more--your money might I add. You have to notice how Miss Ashra's email is more personalized and ends in "dot net"
@Lynsey Thank you so much for this very detailed information. Not is it gonna help me but it’s gonna help everyone to decipher between the REAL ASHRA and the ones who pretend to be her. It’s also good to know that Ashra has people like you riding and going hard for her....that alone proves how good she is! I haven’t come across any of the other but I’m definitely gonna be on the lookout for them. Ashra has a lot of impersonators due to her success rate, those people are using her name and pretending to be her to get a lot of money for those people who are seeking for help from Ashra. I don't know what is the best words to advice for those people who can possibly a victim of them however I just wanna say that we have to be careful. We should not let any impersonator of Ashra fool us because they do just care for money. We have to be genuis and strict on dealing and make sure that that is the real Ashra koehn. Hi always be careful and take a time to verify and validate the sites and email you we're receiving that impersonate Ms Ashra. Because Ms Ashra is so popular nowadays, there are so many people taking advantage to scammed people. So to be sure one of the thing you must find is this forum where you can read and find false sites and emails of Ms Ashra. Always go with only verified email and check if you kind find it suspicious. It would also help if you report it directly to Ms Ashra to take down that scammed sites and also to aware future clients of Ms Ashra. Just so you know Ms ashra will not force you to purchased and spells and if you're lack financially she would be willingly to help without any cost.